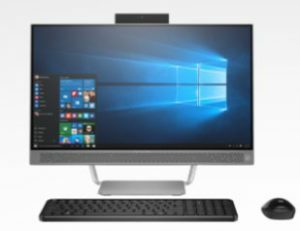 The HP Pavilion All-in-One PC 23.8″ desktop is a customizable PC built with futuristic sophistication and industrial design. We definitely can describe the HP Pavilion computer as an AIO that embodies beauty without sacrificing power. At first, the 1TB hard drive may discourage consumers from considering the HP Pavilion. However, HP made sure that the HP Pavilion All-in-One PC 23.8″ would have its own perks. 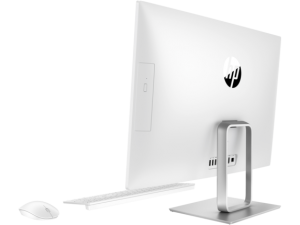 With DTS Studio Sound, the HP Pavilion All-in-One PC 23.8″ diagonal touchscreen with IPS technology is one of the slimmest displays in comparison to all-in-one PCs out in the market. This flushed- glass FHD screen is a one unit that containing optical drive and the entire CPU. Users are able to avoid clutter as this model’s setup will only require one wire. The HP Pavilion All-in-One PC 23.8″ comes with not the latest Intel Core i7-7700T processor. Other operating systems are available to choose from, but the Pavilion is a future-generation AIO that will run best with Windows 10. Enjoy viewing movies, videos and photos with this HP model’s edge-to-edge glass display. Along with HP’s TrueVision webcam, high definition is reciprocated from the user’s point of view to his conference partner’s received stream. The Intel HD graphics will also keep this HP AIO PC performing graphic-intensive tasks with ease. The HP Pavilion All-in-One PC 23.8 comes with 1 USB 3.1 (battery charging 1.2); 1 USB 3.1; 2 USB 2.0; 1 headphone/microphone combo, 1 HDMI-out; 1 HDMI-in. Among its other built-in connectivity provisions, the HP desktop also has wireless mouse and wireless keyboard. The HP desktop is unlike most all-in-one desktops. It’s bold, comfortable 23.8″ Full HD ISP ZBD screen tilts up to 30° for maximum comfort. The list below will summarize this AIO pros and cons. 1. Ultra Thin Modern Design. This HP Pavilion’s thin display and overall slim frame will look elegant without taking too much work space, plus tilted adjustable design make it really comfortable for all day use. 2. Audio B&O PLAY dual 2 W speakers. The HP Pavilion 23xt takes advantage of HP’s B&O PLAY. Users will be able to enjoy rich-textured audio with studio-type quality. 3. Included HP Slim Wireless keyboard and mouse kit with remote. HP made sure that users are still able to enjoy Windows 10 by including a mouse and keyboard for touch-related motions. 4. Optical Drive. The HP Pavilion equipped with an optical drive DVD-Writer. Some customers reported sometimes in sleep mode, it will shut down. The HP Pavilion All-in-One PC 23.8″ desktop has excellent touch screen tilted display. User can enjoy a better 10-point touch experience from every angle with a screen that tilts up to 30° for maximum comfort. A stand out feature in this all-in-one PC is its speakers, which designed for the best-sounding, richest audio on a PC.